Selecting the right tyre type for the vehicle you are driving and for the purpose the vehicle is being used is vitally important for the safety of the driver, passengers and any other road users or pedestrians. It is for this reason that the legal limit for minimum depth of the tread on your tyres is 1.6mm across the central three quarters of the tread around the complete circumference of the tyre. For safety reasons it is recommended that you have your tyres replaced before the legal limit is reached, at approximately 3mm. It is also a legal requirement to ensure that tyres of different construction type (radial and cross-ply) are not fitted to opposite sides of the same axil. There are many different reasons for tyre wear other than usage and age. Emergency braking, under or over inflation and misalignment of wheels all contribute to more rapid deterioration. It is the driver’s responsibility to ensure the tread is not worn below the legal requirement and failure to do so may result in 3 penalty points on your license and a potential £2500 fine per tyre. 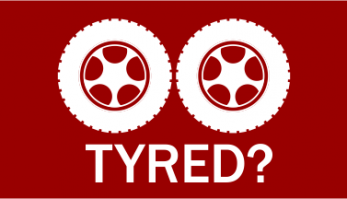 Due to the gradual nature of tyre deterioration it is difficult to identify any reduction in performance in gripping the road or braking times so it is best to have them checked regularly by an expert. Here at SRSC we are able to provide you with a professional service, the convenience of a local garage and offer you, in partnership with our neighbouring tyre dealer, the highest quality tyres, competitively priced. You can use this link to book your free tyre inspection or alternatively call us on: 01773 260110 and one of our team will book your vehicle in.